Parenting research is all well and good, but it doesn't actually explain in necessary detail how to be a warm/responsive/supportive parent, and resist the urge to throw the blighters out the nearest window. 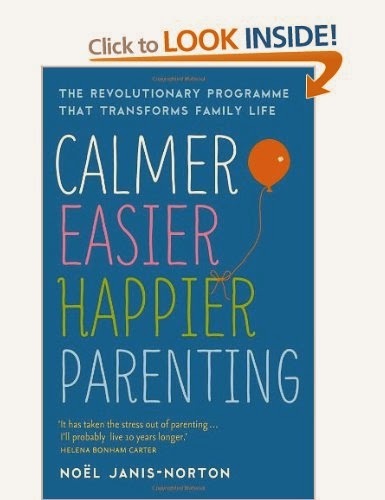 I stumbled upon Calmer, Easier, Happier Parenting a year or two ago while browsing in a bookstore. I bought it because I liked the look of the cover. I love this book. It's not rocket science. It covers things like praise, bedtime routines, eating, planning with your children. But the detail is brilliant. For example, she talks about not saying "That's fantastic!" about your child's latest (pretty crappy) drawing, but instead, "You're really focussing well on that drawing." And to aim to descriptively praise at least ten times per day. I love me some detailed instruction. Anyway, this is the parenting book I recommend, even though I don't agree with everything in it. No, Noel, boys don't need dads any more than girls do. No, Noel, first-borns do not need more one-on-one attention than later borns. But for all the parenting strategies I know that I should be using, I find her clear, step-by-step guidance really useful.